"Around Harvard Square is] C.J. Farley's fun novel about an exceptional Jamaican student-athlete facing class and race issues to get a spot on an elite Harvard University humor magazine." "C.J. Farley's Around Harvard Square is a witty and artful narrative of a society on the crossroads of change...A must read." "In his new novel, Around Harvard Square, Farley writes about a scandal strikingly similar to how Singer helped parents and coaches allegedly exploit athletic programs of schools like Yale, Georgetown, and USC." 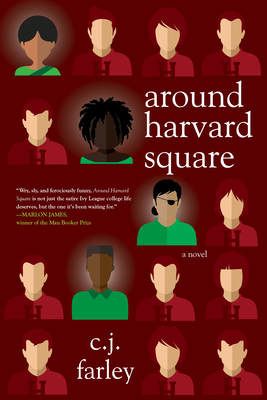 "In this throwback coming-of-age novel, an ensemble of freshmen on the margins struggle for self-definition amid the race and class complexities of Harvard...Through the whirlwind of their journey, they begin to question the purpose of jokes and the consequences of laughter--when it's not just about the joke, but also about who's making it and why (a significant, timely exploration as comedy culture today struggles to demarcate ethical boundaries)...The diverse ensemble of core characters defy and refuse reductive stereotypes...For those who would like to take a trip through the hallowed Harvard halls of the past, this goes out to you..."
"Wry, sly, and ferociously funny, Around Harvard Square is not just the satire Ivy League college life deserves, but the one it's been waiting for." "Brimming with humor and heart, Around Harvard Square is a delight." --Andy Borowitz, creator of the New Yorker's "The Borowitz Report"
Tosh Livingston, superstar student-athlete from small-town USA, thinks he's made it big as a rising freshman at Harvard University. Not so fast Once on campus, he's ensnared in a frenzied competition to win a spot on Harvard's legendary humor magazine, the Harpoon. Tosh soon finds that joining the Harpoon is a weird and surprisingly dangerous pursuit. He faces off against a secret society of super-rich kids, gets schooled by a philosophy professor who loves flunking everyone, and teams up with a genius student-cartoonist with an agenda of her own. Along the way, Tosh and his band of misfit freshman friends unearth long-buried mysteries about the Ivy League that will rock the Ivory Tower and change their lives forever...if they can survive the semester. C.J. Farley has worked as a senior editor for the Wall Street Journal and Time magazine, and is the author of such novels as Game World, Kingston by Starlight, and My Favorite War. Farley served as consulting producer on the Peabody-winning HBO documentary Mr. Dynamite: The Rise of James Brown and wrote the best-selling biographies Aaliyah: More Than a Woman and Before the Legend: The Rise of Bob Marley. Farley, who was born in Kingston, Jamaica, is a graduate of Harvard and a former editor of the Harvard Lampoon. He is currently an executive editor at Audible.